Flopping down in your car after a hard workout might feel good, but it isn't particularly great for your upholstery. That's why Ford has developed a robotic backside, specially created to ensure its seats are up to the challenge. The charmingly named Robutt is built to the match dimensions of a large man, and is intended to simulate a decade of car use and gym visits in just three days, bouncing and twisting 7,500 times on a hydraulic arm. To ensure the fabric and padding is durable enough to survive the drive home after an intense gym session, the Robutt is heated to a cosy 36C (human body temperature) and doused with 450ml water to simulate sweat. "Cars are a part of our everyday lives, and at this time of year in particular, so is exercise,” said Florian Rohwer, development engineer at Ford of Europe's Body and Chassis Labs. “The ‘Robutt’ is a great way to check our seats will look good for years to come." 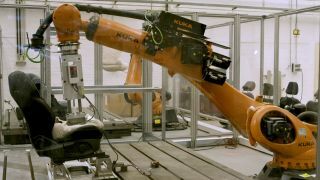 The Robutt was first introduced for the 2018 Ford Fiesta, and is now being used to test seats on all of the company's cars throughout Europe.